One lives with us and we're glad that she does. The other doesn't and we wouldn't mind if he did. 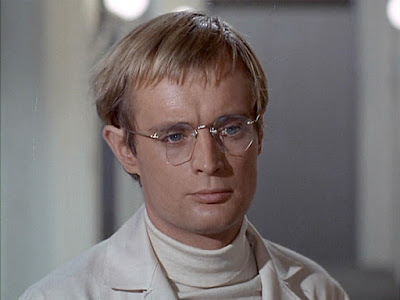 For the children in the audience, that's David McCallum. You know, Ducky on NCIS. Illya Kuryakin was the role he played in Man From U.N.C.L.E. back in the day when TV was steam-powered. History has not been kind to Neville Chamberlain. But that's beginning to change. Folks are beginning to realize that Chamberlain did exactly what needed to be done given the lay of the land at the time. Read and learn. England came out of WWI dazed and confused. The war had been brutal beyond imagining. Those men and women who survived and came home were forever changed. The social structures upon which British society was based were crumbling. Britain was not prepared physically, emotionally, or materially to take the steps necessary to thwart Hitler's European ambitions. Under the circumstances, the best that Chamberlain could do was to stall, to give his country time to take a deep breath, see the situation clearly, and make preparations to face the coming storm. That's what Chamberlain did, a thankless task as demonstrated by the inaccurate judgement of history that he facilitated Hitler's conquests. Rather, what Chamberlain did was to give his country just enough time to prepare, to endure, and finally to retaliate and win. Iran is a different issue entirely but people who mistakenly accept the discredited view of Chamberlain are equally mistaken about the prospective nuclear agreement. 1. Do nothing? Keep the sanctions in place, even tighten them? So what? All that means is that Iran, if it really was working on The Bomb, gets to continue working on The Bomb. From the initial round of sanctions in the 70s to their expansion in the 90s to the 'crippling' sanctions imposed in 2006, Iran has continued its slow march toward nuclear capability. The simple fact is that any country sufficiently large with sufficient brain power and sufficient will can develop The Bomb. Blueprints are on the web. Do nothing? Bad idea. 2. Bomb Iran? Really? How well has the idea that bombing settles things in the Middle East worked out so far? Is Iraq stable? Is ISIS on the run? Heck, has Israel managed to pacify tiny little Gaza through military action? Do we really want Iran - and probably Israel as well - actively engaged in all-out warfare in the region instead of working through surrogates. They're making enough mischief as it is. Bomb Iran? Bad idea. 3. Engage and negotiate? Let's look at two countries in Asia with which the United States has been at war - North Korea and North Vietnam. We are technically still at war with North Korea though we've beaten them back behind barbed wire. China, their only real friend, hasn't exactly been happy with them lately. They are an international pariah, isolated and alone. And they developed The Bomb. North Vietnam, on the other hand, chased us out and thumbed their noses at us. But now, after what hardly counts as a decent interval, they are a cruise ship stop and a trading partner. Barbed wire and isolation versus engagement and negotiation? Which approach has the better outcome in modern times?